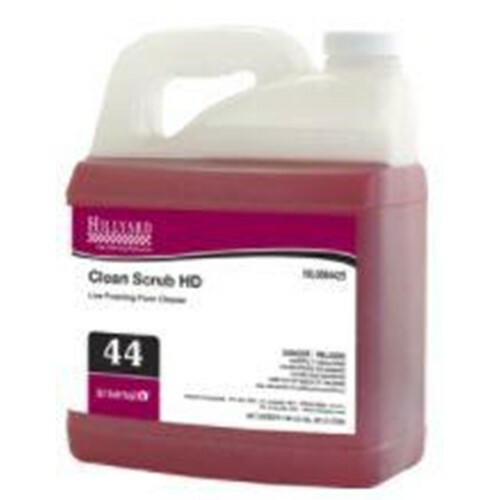 Home → Chemicals → Hillyard, Arsenal One, Clean Scrub HD #44, Dilution Control, HIL0084425, Four 2.5 liter bottles per case, sold as One 2.5 liter bottle. Clean Scrub HD is a low foaming floor cleaner designed for everyday use through an autoscrubber. It contains a unique blend of surfactants to quickly clean floors without leaving a film. Cost Effective, 1/2 oz per gallon dilution rate. Contains no soap, phosphates, free alkali or ammonia.